Planning the manipulators’ task sequences is necessary for proper execution of specific robotic tasks. With multiple manipulators for cooperative tasks, planning becomes difficult owing to possible collisions between component manipulators. 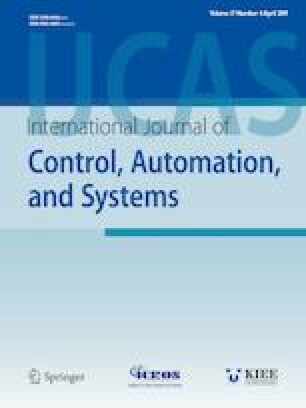 This paper proposes a shadow space approach that utilizes the swept area of a robot during its motion, for collision-free task planning of dual manipulators. A collision can be detected and prevented by computing the intersection of two manipulators’ shadow spaces. Then, a novel genetic algorithm with mutually exclusive chromosomes is proposed to search optimal collision-free task sequences for dual manipulators. For a pragmatic example of placing pemnuts onto the back-chassis of a liquid crystal device (LCD) panel, experiments and simulation show that the proposed method can determine a nearly optimal sequence, which allows two manipulators to move cooperatively without collisions, even though they share a common workspace. Recommended by Associate Editor Seok Chang Ryu under the direction of Editor Won-jong Kim. This work was supported by research grants from Daegu Catholic University in 2017. Hyun Joong Yoon received his B.S. degree in Mechanical Engineering from Yonsei University, Seoul, Korea, in 1997, and M.S. and Ph.D. degrees in mechanical engineering from Korea Advanced Institute of Science and Technology (KAIST), Daejeon, Korea in 1999 and 2004, respectively. From 2004 to 2005, he was a postdoctoral fellow at the Integrated Manufacturing Technologies Institute of the National Research Council Canada, London, ON, Canada. He was a senior researcher at the Mechatronics and Manufacturing Technology Research Center, Samsung Electronics Company, Ltd., Suwon, Gyeonggi-Do, Republic of Korea from 2005 to 2008. He has been on the faculty of the School of Mechanical and Automotive Engineering of the Catholic University of Daegu, Korea since 2008, where he is currently an associate professor. His current research interests include modeling, optimization, and simulation of automated manufacturing systems. Seong Youb Chung received his B.S. degree in Mechanical Engineering from Yonsei University, Seoul, Republic of Korea, in 1994, and his M.S. and Ph.D. degrees in Mechanical Engineering from Korea Advanced Institute of Science and Technology (KAIST), Daejeon, Republic of Korea, in 1996 and 2005, respectively. From 2005 to 2007, he was a senior research engineer at the Institute of Industrial Technology, Samsung Heavy Industries Co., Ltd, Daejeon, Republic of Korea. He has been on the faculty of the Department of Mechanical Engineering of the Korea National University of Transportation, Chungju, Republic of Korea since 2007, where he is currently a professor. His research interests include human–robot interfaces, multiple robots, and machine vision. Myun Joong Hwang received his B.S., M.S., and Ph.D. degrees in Mechanical Engineering from the Korea Advanced Institute of Science and Technology (KAIST), Daejeon, Republic of Korea, in 2001, 2003, and 2007, respectively. He is an assistant professor in the Department of Mechanical Engineering, Korea National University of Transportation, Chungju, Republic of Korea since 2015. He was a research associate at the Mechanical Engineering Research Institute, KAIST in 2007. From 2008 to 2009, he was a research associate in the Department of Electrical Engineering and Computer Science, Case Western Reserve University, Cleveland, OH, USA. He was a senior research engineer at the Manufacturing Technology Center, Samsung Electronics Company, Ltd., Suwon, Republic of Korea from 2010 to 2013. He was an assistant professor in the School of Mechanical and Automotive Engineering, Halla University, Wonju, Republic of Korea from 2013 to 2015. His research interests include motion planning and control of manipulator, cooperation of multi-robots, and medical robotics.